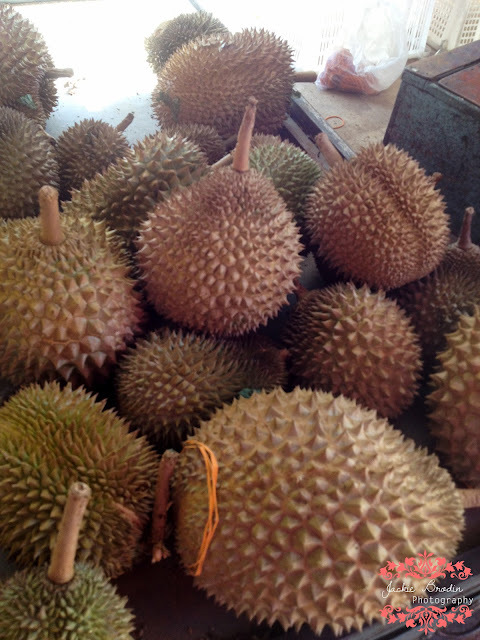 The Uncle from Balik Pulau said ...."After the Bak Chang Festival, is when the Penang durians will drop from the trees". When I went home earlier this year, I had wanted to visit a durian farm in Balik Pulau, but he said that there was nothing to see at the moment, only a baby durian if any and this was way back in January when I was home. Sigh, the only thing I took away from his nutmeg tour was, that piece of advice. I still don't get the boy nutmeg and the girl nutmeg and the whole reproduction thing. Hehehehehe. So me, being the dumb chinese person, asked "Uncle, so when ah, is the durian season?" He goes "Aiyo, bak chang before Durians.... around July...so after bak chang, durian already come." 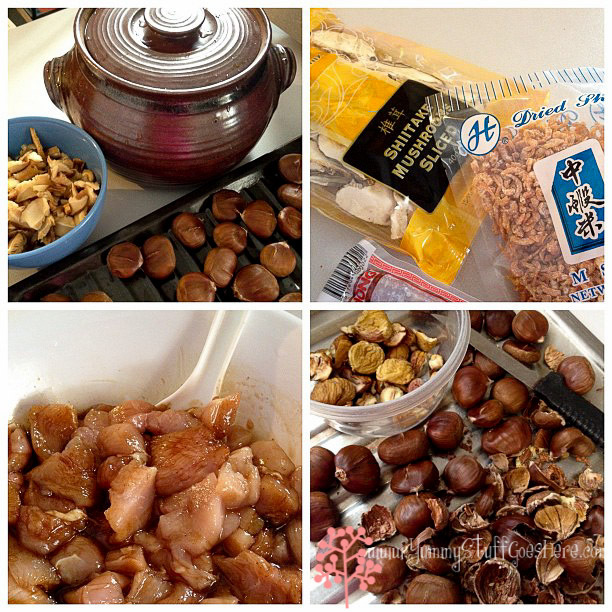 So that means, the Bak Chang festival is around the corner, mind you, I have seen so many photos of people eating and making bak chang. This is a good thing, it can only mean Durian time is straight after! So, no bamboo leaves, no lotus leaves...meh, small matter! It's not going to stop me. We'll go naked! Well, not quite! We have a claypot! Life saver! 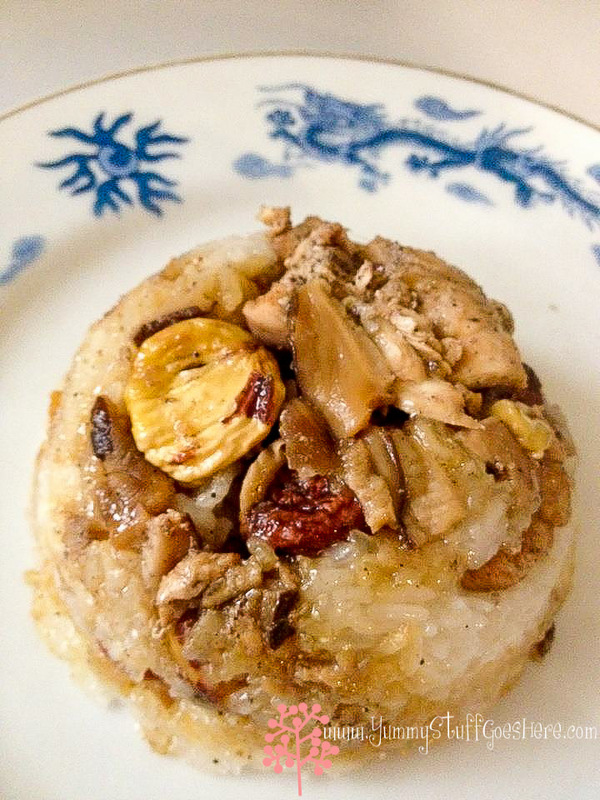 What I ended up making this morning was Loh Mai Kai which is the simpler version, without the wrapping. 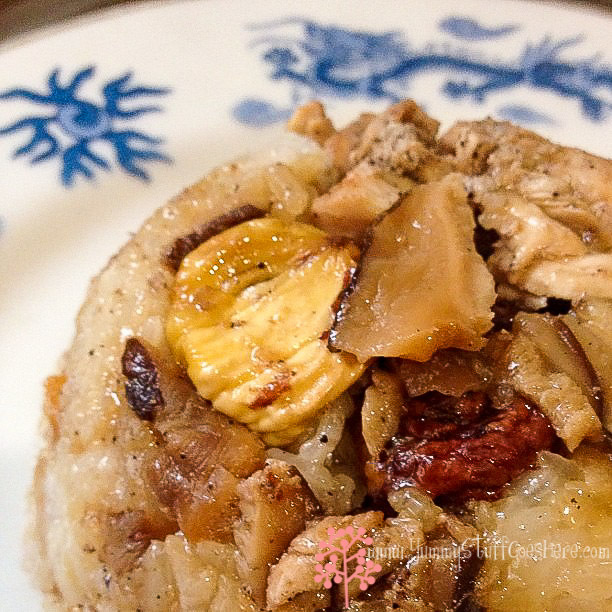 So my version is adapted from http://www.pigpigscorner.com/2009/07/steamed-sticky-glutinous-rice-with.html because there lots that I do not have in the pantry. So I had to make do with what I've got. marinated chicken in dark soy, sesame oil and black pepper. 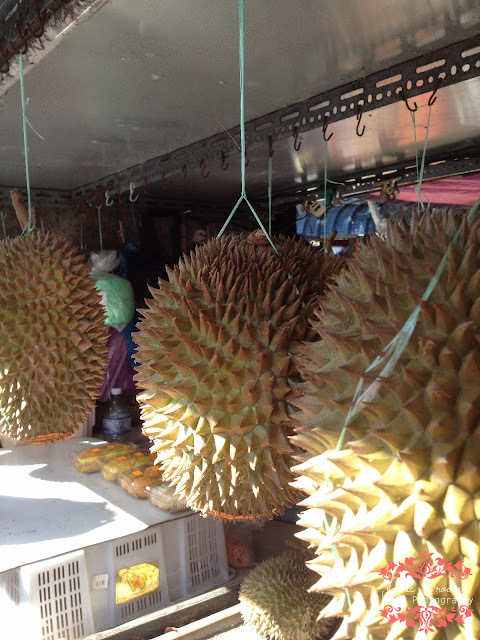 Durians, the King of Fruits has always been a favourite fruit of mine to eat. 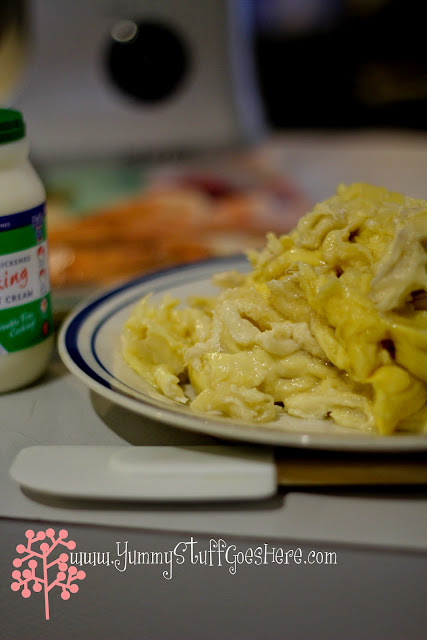 Most people are pretty divided over Durian , you either love it or hate it. For me, it was love at first taste. I recalled my late Father coming home with durians galore, and he would be prying open a durian on the kitchen floor and we would all gather around, like a hungry mob, waiting, ready to grab one, as soon as it was opened. Mum would tell us off for not waiting for the elders to take their pick first. I think my Dad found it amusing that; that come durian eating time, we're like a bunch of animals ;) It's like the Lion dragging it's kill to the young cubs.. I remember my siblings and I would fight over the little ones as they would be seedless and yummiest and softest... seedless yes, yummiest... am sure that is a myth. I like my durian yellow, fleshy and sweet. My sister like the bittersweet types. There are so many varieties of durians all over South East Asia, and during Durian season, you can pretty much try them in a durian fest. Hotels may sometimes do a durian buffet during a fest. You can eat them fresh, cooked, baked, in icecream, in pastries and in cakes and whatever dessert form you can think of. The Thais love them with sticky rice. Me, I tried to make Durian macarons once which was an epic fail. Macarons and I have this love hate relationship... mostly hate, because I can't bake them at the moment. 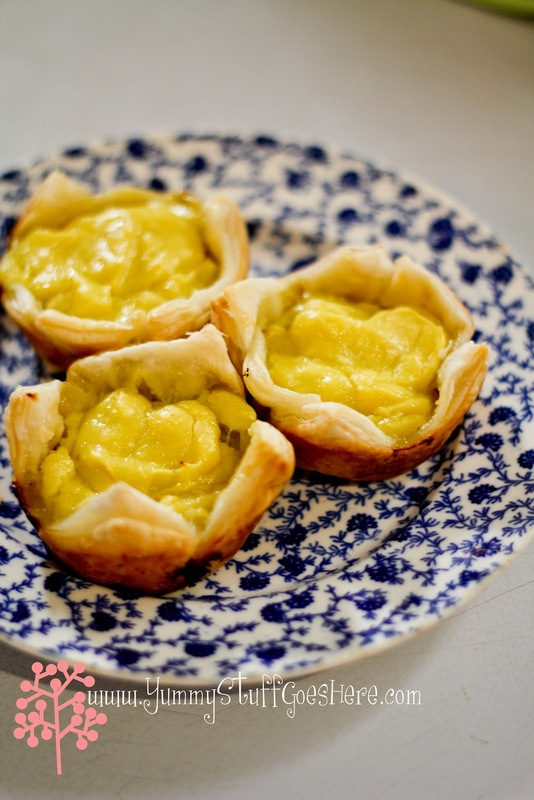 I think of durian season as homecoming as it is pretty much a family gathering affair. Since it is not usually eaten in public but nowadays you can find many durian stalls offering a sit-down area with bottles of water to buy. It is a heaty food and it is recommended that you drink a lot of water to avoid sore throats. 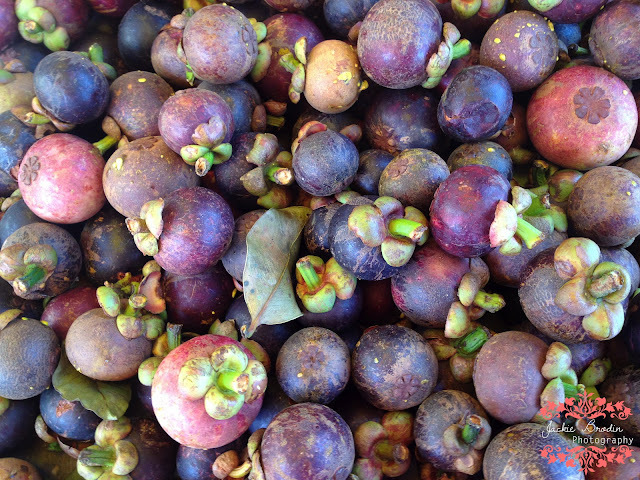 You can also consumed the Queens of Fruits aka Mangosteen (cooling) to counteract the (heaty) Durian. House of Dias, are you laughing at me? I shall try not to burn these.. so exactly the same method, except I used pampas pastry for the fluff and durians instead. Bahhahahahahaha....First, I beat the durians with the cooking cream, why cooking cream? So as not to burn or separate the cream. I use Pampas Pastry for the tart foundation. You baked it in the oven for twenty minutes over 200, watch it don't burn on you. 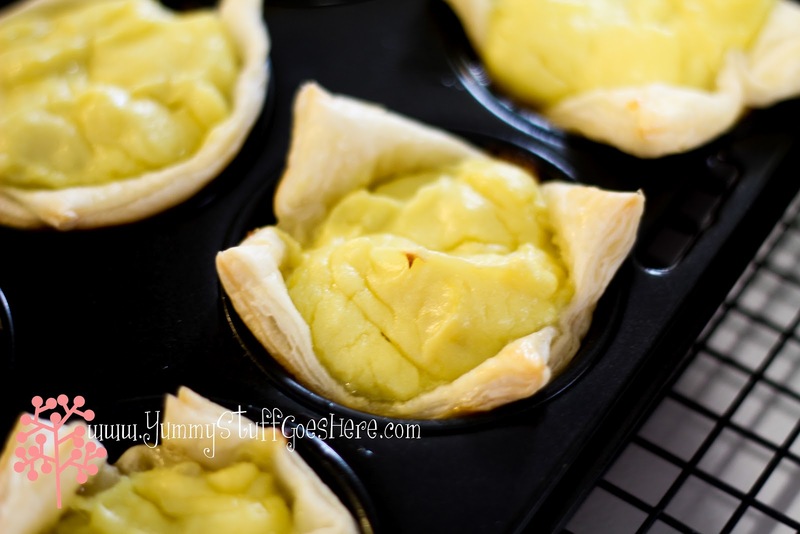 And there you have it, simple Durian Tarts made the easy cheat way, coz life is too short to be slaving over pastries!